This hardware-friendly CRC generator block, like the General CRC Generator block, generates a cyclic redundancy check (CRC) checksum and appends it to the input message. 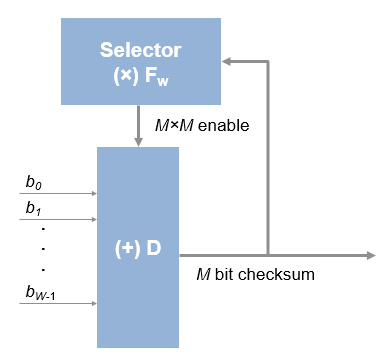 With the General CRC Generator HDL Optimized block, the processing is optimized for HDL code generation. Instead of processing an entire frame at once, the block accepts and returns a data sample stream with accompanying control signals. The control signals indicate the validity of the samples and the boundaries of the frame. To achieve higher throughput, the block accepts vector data up to the CRC length, and implements a parallel architecture. dataIn Input Message data. Data can be a vector of binary values, or a scalar integer representing several bits. For example, vector input [0 0 0 1 0 0 1 1] is equivalent to uint8 input 19. The data width must be less than or equal to the CRC length, and the CRC length must be divisible by the data width. For example, for CRC-CCITT/CRC-16, the valid data widths are 16, 8, 4, 2, and 1. A double or Boolean vector specifying the polynomial, in descending order of powers. CRC length is length(polynomial) – 1. The default value is [1 0 0 0 1 0 0 0 0 0 0 1 0 0 0 0 1]. HDL Coder™ provides additional configuration options that affect HDL implementation and synthesized logic. For more information on implementations, properties, and restrictions for HDL code generation, see General CRC Generator HDL Optimized in the HDL Coder documentation.